Her cricketing career may have won her any number of trophies and seen her travel all around the world but for England wicketkeeper Sarah Taylor there’s nothing like playing at home. A Sussex local, she also attended Brighton College and still plays for her home county when England commitments allow, she’ll be back on her home patch on Bank Holiday Monday, playing for Surrey Stars in Finals Day of the Kia Super League. It’s a far cry from those years when, as a youngster, she’d take part in Kwik Cricket tournaments on the Hove outfield but one thing that will remain the same is the support of her family. “I’ll have quite a few of the family in on Monday. My parents, sister, brother-in-law, aunty and uncle will all be coming along to cheer me and the Surrey Stars on. “I love being back at Hove. It’s always been my home ground and there’s nothing as special as getting the chance to do what you love in front of people you love. 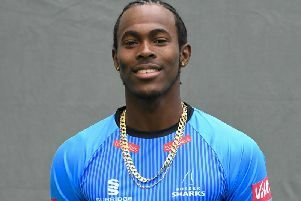 “I’ve played there every year since I was about 15 – and I would have been even younger than that when I was playing in Kwik Cricket tournaments – and it’s just a special place to play. Taylor’s Stars side will face England captain Heather Knight’s Western Storm in the day’s semi-final, with Loughborough Lightning – captained by fellow Sussex player Georgia Elwiss – awaiting the victor. If the Stars were able to make it past Storm it would set up their first appearance in a KSL final and Taylor is confident her side can come out on top. “The three teams are very tightly matched. We’ve beaten each other at various points and while we finished third in the table we ended with a bit of momentum behind us so that may help us out. “It’s obviously tough to play two games in a day but Storm managed to win the tournament last year via that method and there’s no reason we can’t do it. Tickets for the Kia Super League Finals Day at The 1st Central County Ground on Bank Holiday Monday are available now fromwww.sussexcricket.co.uk/tickets priced at £5 for adults and £1 for children.